Ever have someone ask “who changed that data” or “when did that data change” or maybe “I need to see all changes to that data from last week”? There are many cases, from internal monitoring and quality control to external regulations that require basic auditing of data: what changed, who changed it, and when did it change. Usually triggers or expensive data access comparisons were used to track what was being changed. But now there are some built in database technologies to track these changes for us. SQL Server 2008 introduced two new auditing features called Change Tracking and Change Data Capture. In the simplest terms, Change Tracking tracks changes at the record level, while Change Data Capture tracks changes at the field level. Each has strengths depending on your auditing needs. This article will concentrate on Change Data Capture (CDC) and will give an example of how to enable CDC on a database and table, and how to use some of the CDC stored procedures and functions to review the change data. In the next article, we will mart the data from the change table into a data warehouse using SSIS and then present the data in a simple SSRS report. I currently work as a contractor for a government agency that deals with conservation contracts for farmers and ranchers. The main web application is used by over 10K users nationwide. Since the application deals with money, we are audited yearly by both internal and external auditors. One question they always ask is who is changing the data. We know who the user is making the changes so we stamp the records with the user id of the user who made the last change. Using triggers, we write a record history of the record level changes, but decided against trying to track field level changes due to performance and resource concerns. Now with CDC, capturing those field level changes is easy and can be implemented in a way as to not hurt performance on production database systems. Another benefit of capturing the field level changes is with ETL processing of data warehouse and mart data, nightly delta changes can be applied without having to do a full data refresh. CDC uses the transaction log to capture record changes for the tracked source tables. As changes are written to the transaction log, the capture process reads those changes and populates associated change tables. The capture process uses the same process as replication to read the transaction log, in fact CDC was written by the SQL Server Replication team. CDC is a simple, clean way to capture field level data changes. Next, specify which tables you want to track using CDC. Use the stored procedure sp_cdc_enable_table to do this. The @filegroup_name parameter is used to specify a different file group for the change tables. It is recommended that the changes tables be put in a separate file group to minimize the performance impact of writing data to the change tables on normal database processing. You can also use the @role_name parameter to specify a database role that has access to the change table data. Otherwise normal SELECT permissions are used to determine if a user can read the data in these tables. By default, all columns in the source table are added to the change table, but you can use the @captured_column_list parameter to subset that list if needed. Executing this command does a few things. It creates the change table used to store the data by appending “_CT” to the schema and table name. It also creates functions that can be used to view this change data, fn_cdc_get_all_changes_ and fn_cdc_get_net_changes_. Using these functions, the change data can be queried looking at all records or just net changes over a designated time span. The capture job monitors the transaction log for entries related to the change tables and moves those changes to the change table. Since CDC uses the same process as replication, if replication is already enabled on the database, a separate capture job will not be created. CDC will just use the existing replication log reader job. The cleanup job will delete data from the change table on a regular schedule to keep it from growing too large. By default the cleanup job will delete data after three days, but this retention period can be adjusted using the sp_cdc_change_job stored procedure. Update Before has the original row values before the change and Update After has the new values after the change. The __$update_mask column is a bit flag with one bit for each captured column. The bit will be set if the field changed during the operation. 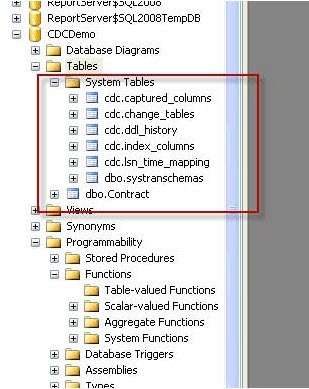 The remaining columns are the captured columns from the source table. You can see in the results that there are two Inserts, one Delete, and an update, before and after, mirroring the changes we made. The results show the IsUpdated fields set if the operation changed the corresponding field. These flags can then be used to generate reports showing what changed at the field level, who made those changes, and when the change happened. Change Data Capture is a cool new feature introduced in SQL Server 2008. Using this technique, the holy grail of tracking field level changes can be implemented in a clean and efficient manner. In this article we looked at how to enable CDC for a database and table, and reviewed some of the stored procedures and functions that can be used to view the data in a meaningful way. In the next article we will look at marting the change table data using SSIS and create a SSRS report to view those changes. You can’t always keep people’s hands out of the cookie jar, but with CDC, you at least know whose hands those are. There are also templates in SSMS that show the basics for how to use CDC.